FREE Shipping within the UK, if you order any 2 or more jigsaw puzzles! Click “create your jigsaw puzzle” to start personalising this product, you will be able to upload your photo, add text, choose quantity and add it to your shopping cart. Minimum quantity for "6 piece promotional jigsaw puzzle" is 10.
promotional and tray jigsaw puzzles. Pay only for delivery! Order production time does not include delivery time! 6 piece promotional jigsaw puzzle will be unique invitation! Personalise this 6 piece promotional jigsaw with your own design to create unique invitation or greeting card! 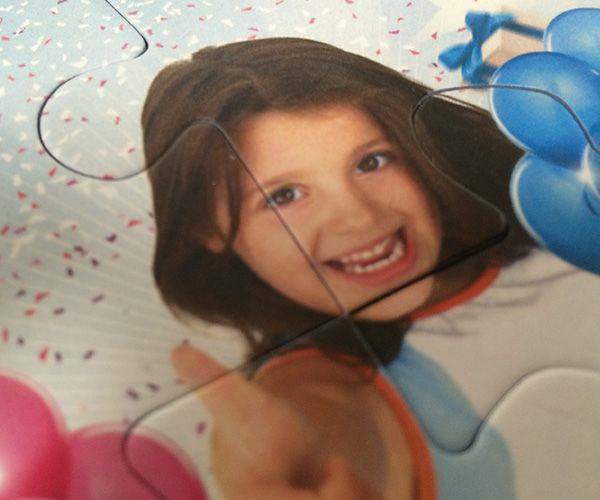 It is up to you to decide what to print on the jigsaw, as you can customise it with any artwork you like. 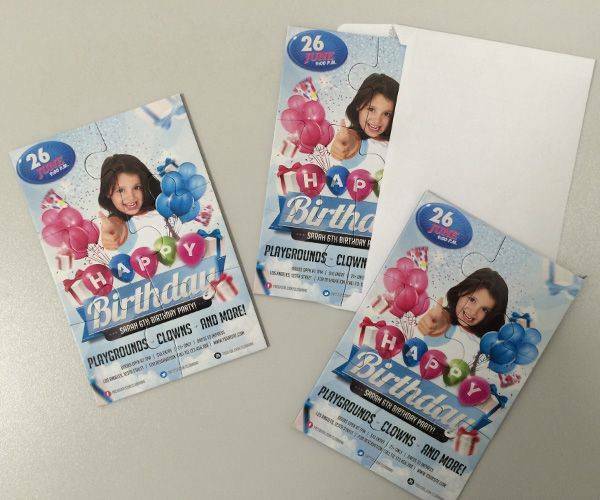 6 piece promotional is ideal for kids Birthday invitations! If you want to get in touch with your customers and let them know that you have a new product out, or are changing premises there are a number of ways to do it. One could be a simple email, there could be a letter sent, or more often than not it is considered more effective to send out some sort of promotional item. Pen and notebooks are all well and good, but everyone is giving them out and you want to be different. Well, now you can be and it is easy and inexpensive to do. 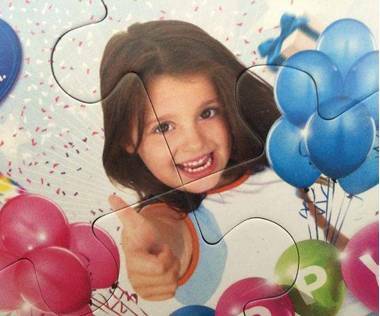 A 6 piece promotional jigsaw can contain all the information that customers need to know and as it is being sent in a fun way, lots of the staff will look at it. It won’t cost a lot to send on as it is packed in a white envelope. As it will be you who is responsible for designing it, it can say exactly what you want it to. Artwork is included, but again it is your responsibility to send that. Finally, the details you want to be passed on - usually company name, address and contact details can be added to the 6 piece jigsaw. It will be necessary to order at least 10 of the one design, and each one measures 3.9” x 5.9” – easy to put together and also easy to store as you will want them to be close at hand for the people who are responsible for placing orders with you. 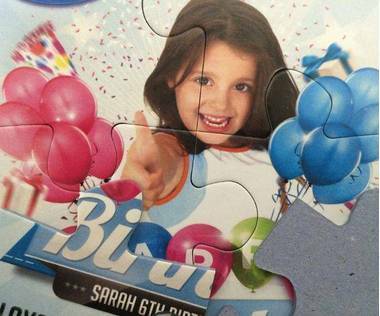 After a short period of time, you will find out if the people who received 6 piece jigsaw place more orders and then if that is the case, you can order more. You may even have had feedback regarding what is missing and then the next lot should have even more of an impact. To make sure that the picture is clear enough, each photo must be at least 1000 x 1500 pixels and if you struggle to get the picture right, an expert will be able to advise you what has to be done. It really is this simple to get an effective jigsaw sent to your customers. Love the puzzles Good quality. Pieces fit together tightly and true. You know when it's the right piece by the fit. Will order again Thank you. PuzzlesPrint specialises in jigsaw puzzle manufacturing. 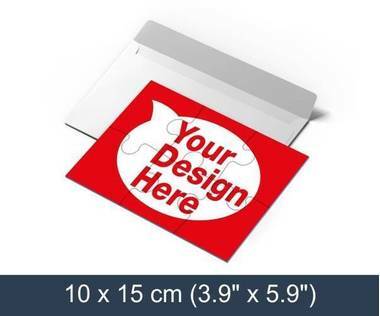 Using our services, you can upload your picture, design or artwork to order a bespoke personalised jigsaw, magnetic jigsaw, photo collage jigsaw, photo frame jigsaw, wooden jigsaw, plastic jigsaw or promotional jigsaw. All our products can be delivered within the United Kingdom. We accept all major Credit/Debit Card payments and PayPal secure payment processor. Deliveries are handled by UPS and DHL courier services.